I’m a Sucker for Tiny Things – Mini Ice Cream. They’re adorable and were only $1.00 each. 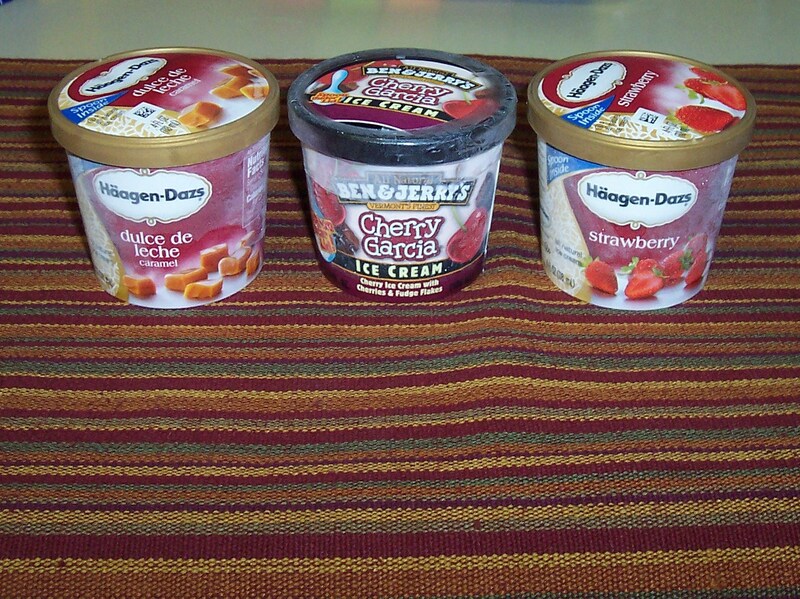 Quite a nice Smorgasbord — Dulce De Leche, Cherry Garcia and Strawberry. All come with a convenient spoon in the lid. 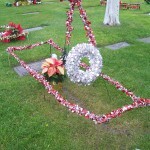 In Loving Memory of a Masterful Meat Cutter. 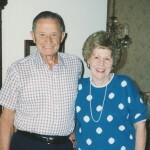 My Grandpa, Vaughn Moomey passed away this week at the age of 90. We are going to miss him so much, but we’re also content that he is in a better place with the Lord. For many years he worked hard as a Butcher for Von’s Grocers. I remember having long talks about the various cuts of Beef — It’s a lot more complicated than I imagined. He was a very gentle, patient and loving man. And he still looked handsome at 90. We love you Grandpa, Dad and PaPa. Thanks for being such a Great Man! Last Lunch at MoFo’s Orange County Office. Morrison & Foerster, a well known international law firm just closed its Orange County office in Irvine — I once worked there as a Paralegal. Last week I returned to enjoy one last lunch there with former co-workers and friends. It appeared to be a reunion of twenty years of legal services. The DC Waterfront for Blue Crabs. Steven Woo, a friend in Washington, DC often goes for 40 mile bike rides, then stops to treat himself to fresh Blue Crabs on the waterfront. It’s a great way to spend a Summer day. Here’s the prelude and aftermath he provided. He ate 4 large and 4 extra large Blue Crabs for $15.00 — Sounds like a good deal. And yesterday he went for Bistecca alla Fiorentina. He says the traditional cut is a T-Bone, but his DC version was a 1 kg. Rib Eye. It looks really good. 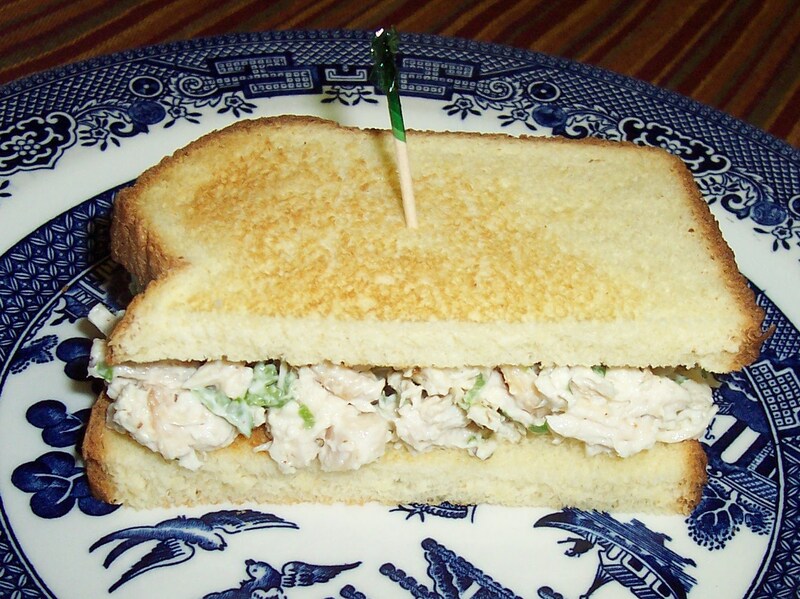 A One Time Serving of Chicken Salad. Are These Getting Smaller and More Expensive? Good Eating Makes Camping More Fun. 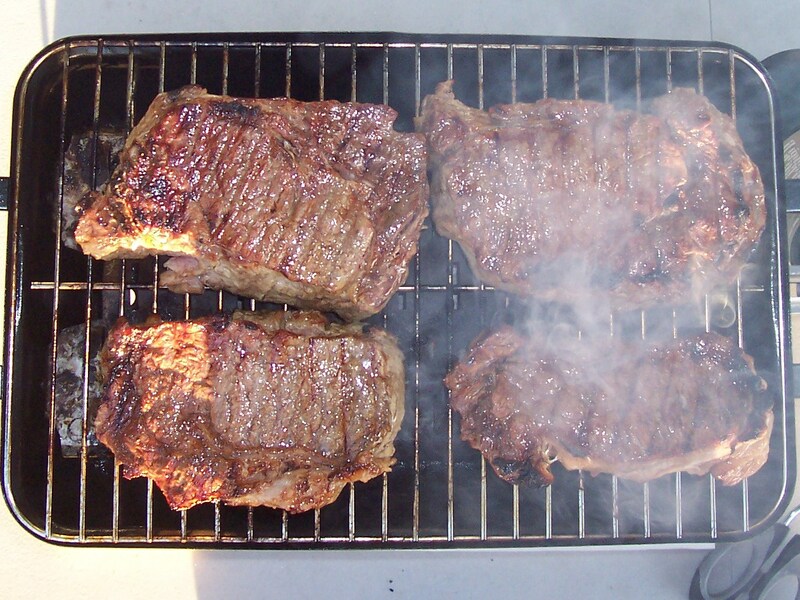 Our MENU included Rib Eye Steaks cooked Medium Rare – Traditional camp fare for many cowboys. 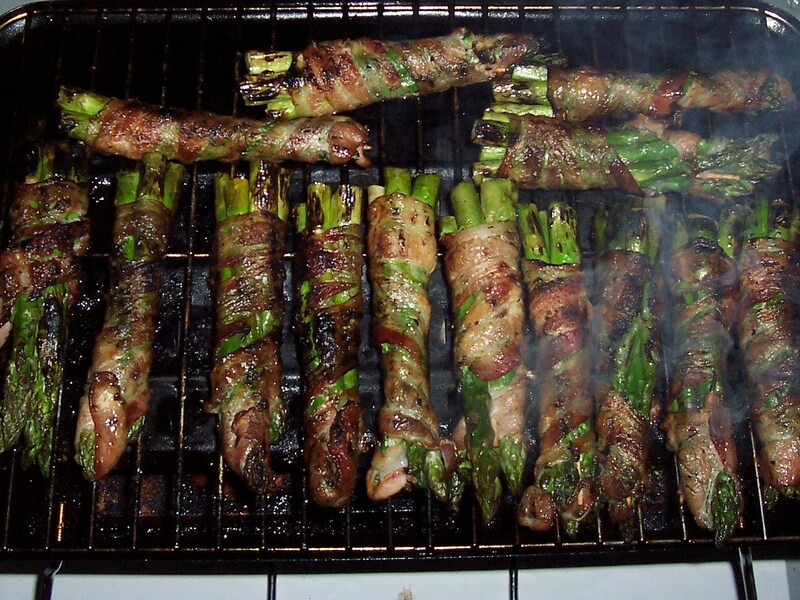 We also grilled Bacon Wrapped Asparagus and Lemon Butter Basted Shrimp — No recipes are needed here, since the ingredients and instructions are within the dish titles. Just wrap, lace, baste and BBQ. Both are simple and Tast-TEE! One luxury camping lunch included home grown Tomatoes, sliced Mozzarella and julienned Basil drizzled with Italian Dressing (or Balsamic Vinegar and Olive Oil). With that we munched on Chips and Bleu Cheese Dip, Fresh Cut Cantaloupe, and Artichoke Hearts. Another night we had Tacos rolled in freshly cooked Uncooked Flour Tortillas. Yes, that sentence is correct. See related links for more information. For breakfast we made Scrambled Eggs with Soy Sauce, Mini Bagels & Cream Cheese, and Mimosas. Another lunch included Ham, Salami, Provolone, Pickle and Tomato Sandwiches. Dessert was easy. We brought Rice Crispy Treats, Cupcakes (various flavors, kinda like a dozen Doughnuts), and Fudge. All were homemade. The recipe on the Kraft Marshmallow Cream Jar is our favorite Fudge Recipe. And you know where to find the Rice Crispy Treats recipe. The Cupcake flavors prepared here are Orange Zest, Lemon Zest, Lime Zest, Raspberry Swirl, Snicker-doodle, Maple Brown Sugar, Chocolate, and Coconut Pineapple. Cupcake recipes to be posted in the future. BTW, our camping was in a large Motor Home on the cliffs of Carlsbad, California, along the beach — We didn’t rough it too bad. Been Camping & Grilling in Carlsbad. 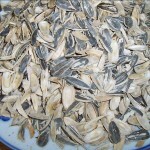 Unique and Tasty Snacks – Dried Fruit. Trader Joe’s is synonymous for unique and tasty snacks. Here are two I’ve recently discovered. 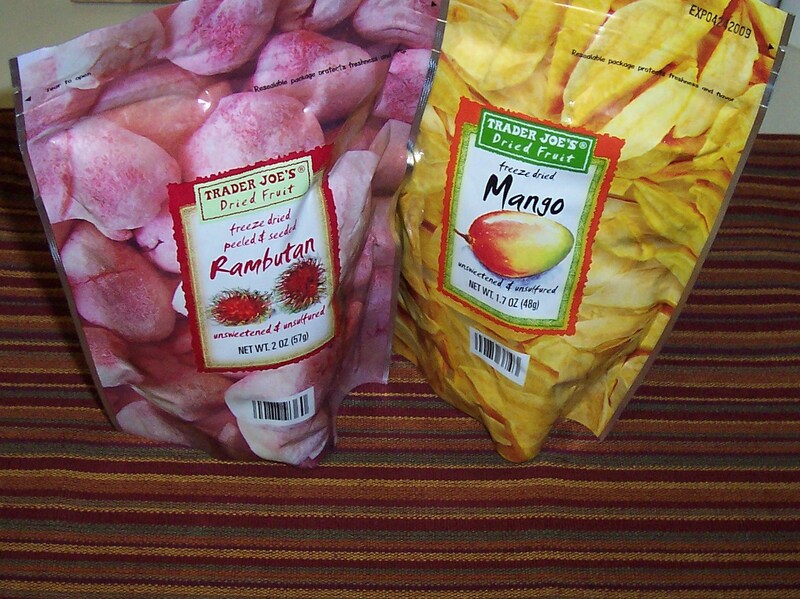 The Freeze Dried Mango spears look like Steak Cut Fries, but they’re feather light. And the Rambutan Fruit grows plentiful in Thailand. Very Progressive Chocolate By Lindt. To me, it’s best described as subtly intense — It’s different and impressive. 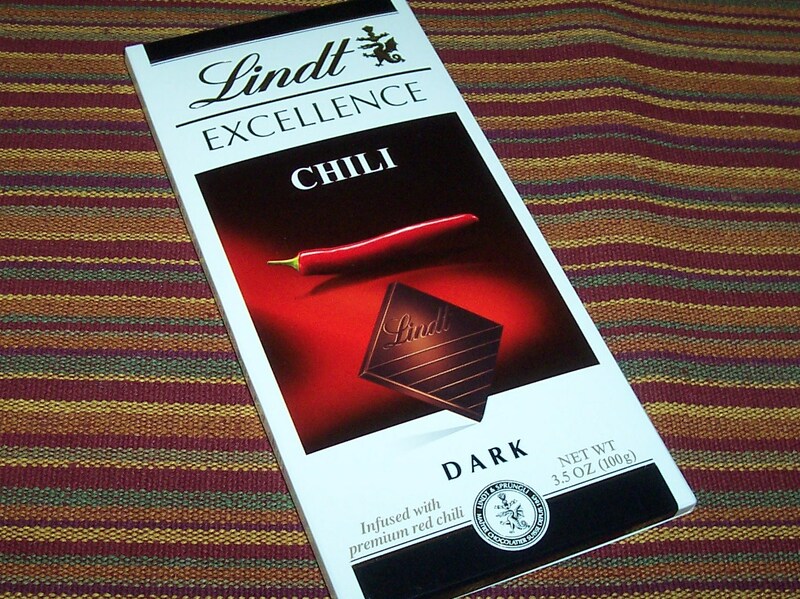 I love Lindt’s progressive Chocolate flavors. They’re fun to try. 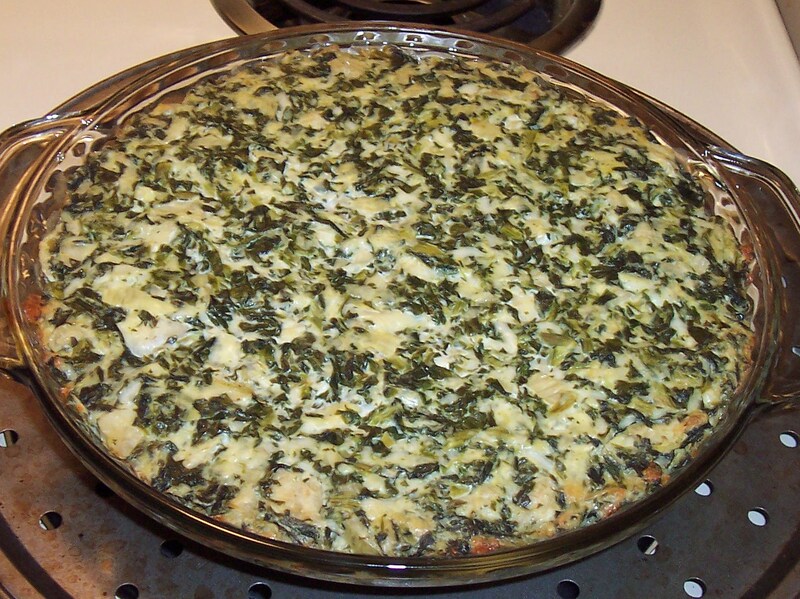 Houston’s Spinach Dip Recipe (My Version). Since I like Houston’s ‘Chicago-Style Spinach Dip’ so much, I wanted to make it at home. 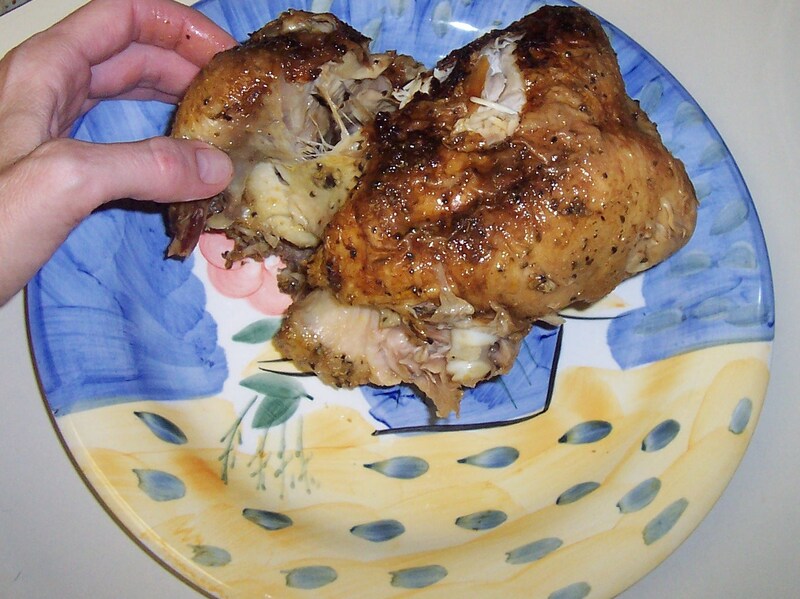 I researched the Internet and came across a few Copycat Recipes, so I tried a couple. I combined and fine tuned all that I learned to decide on the following as my version of the restaurant’s tasty dip, with a little more of the goodies — Artichokes and Spinach. The Houston’s flavors are there. As shown above, first cut off the tough ends of the Artichoke Hearts (if necessary), then mix all ingredients together. Transfer the mixture to an oven proof dish, then bake at 350° for 30 minutes. Houston’s serves their Chicago-Style Spinach Dip with Tortilla Chips, Sour Cream and Salsa, which is great, but at home I usually have it with Stacy’s Simply Naked Pita Chips. It’s hard to find a good bagged Tortilla Chip — But if you prefer the complete Houston’s combination, Have’a Chips are recommended as one of the better packaged Tortilla Chips. El Chinaco Restaurant. See OC Mex Food Blog for the Real Story. 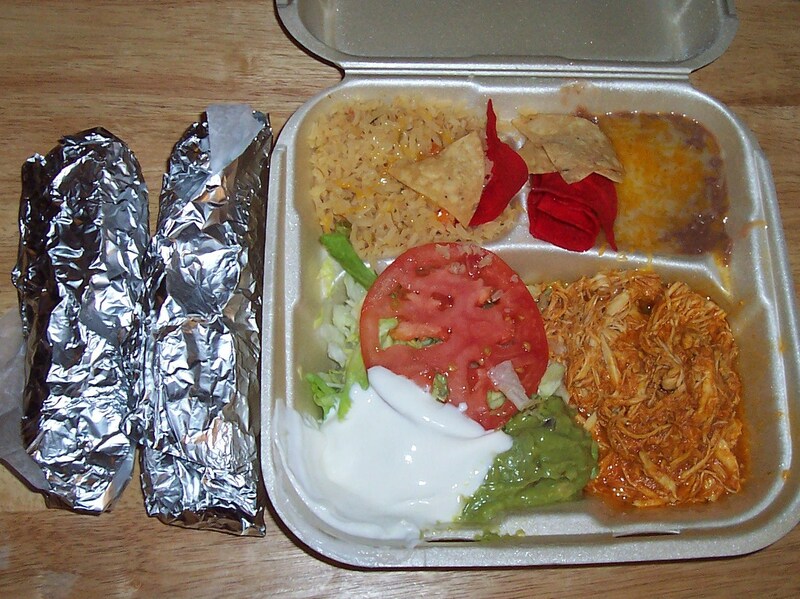 Since I live across the street and receive a bi-monthly coupon in the mail, I’ve been trying a variety of El Chinaco menu items. 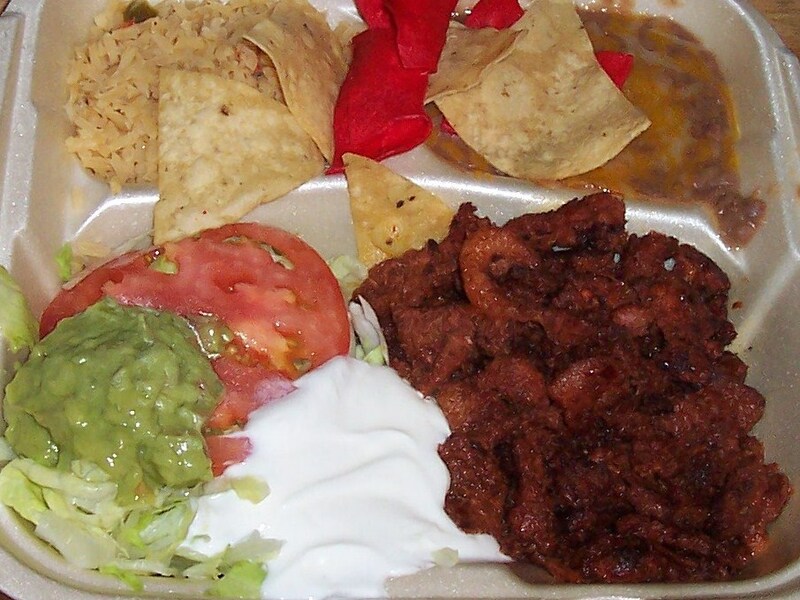 This time it was Adobada (Spicy Pork) and Pollo Combination Plates, respectively shown here. The Clipper Magazine publishes a 2-for-1 Coupon every other month. It’s worth using. 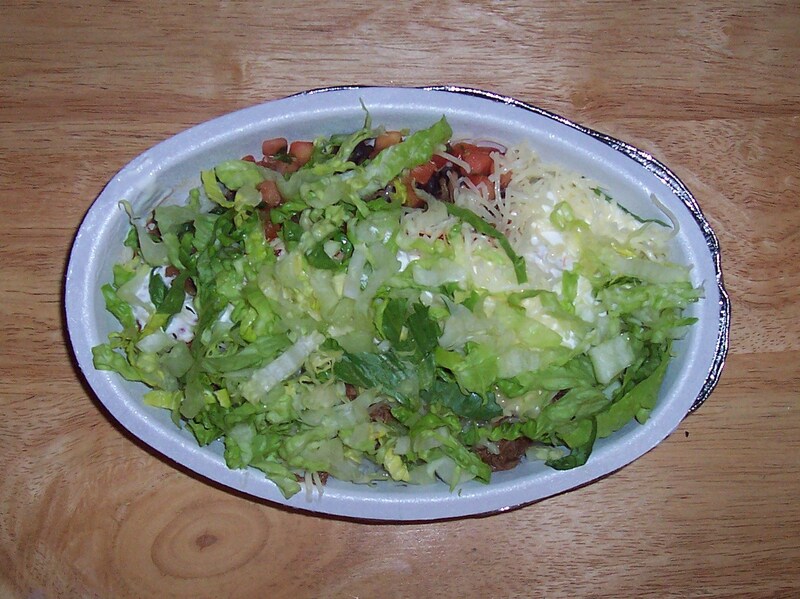 Chipotle Burrito Bowl With Barbacoa. It’s a Burrito. Technically it’s a Burrito Bowl with Barbacoa, a spicy shredded Beef braised with Adobo, Cumin, Cloves, Garlic and Oregano. The Barbacoa Meat has a tasty kick to it. Don’t let the Lettuce fool you — There’s Beans, Rice, Salsa, Corn and Sour Cream below. Overall, I prefer the Tacos with all the same fixins, but the shells get soggy fast if you’re traveling with them. The Burrito Bowl is a good on the go meal. Me & My Impromptu Monkey Bread. Bridgford Ready-Dough — Thawed, set aside to rise, then dipped in melted Butter and rolled in Brown Sugar, Cinnamon, Nutmeg and chopped Pecans. 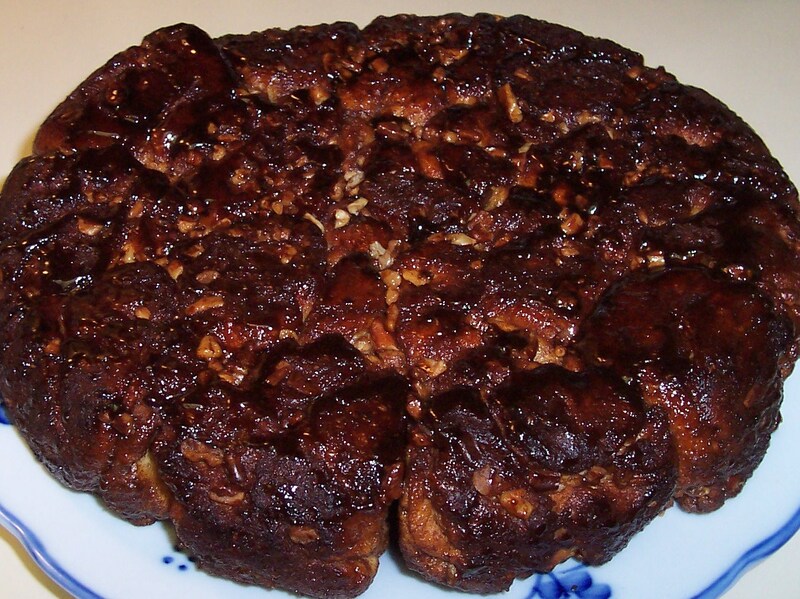 It’s was baked at 375° for 30 minutes, then turned upside-down onto a plate. I wish I could say this tasted as good as it looks, but it was a little dry — Next time I may set it aside to rise again and cook it for less time. FYI: The Post Title was inspired by a Robbie William’s Song – Me and My Monkey. I used to have it linked here, but its origin was unfortunately removed. Robbie Williams is so under-played in the USA. I love his music. I wanted to try to make a quick and easy candied nut, so I mixed Almonds, Sugar, Cinnamon and a little Water in a cup. 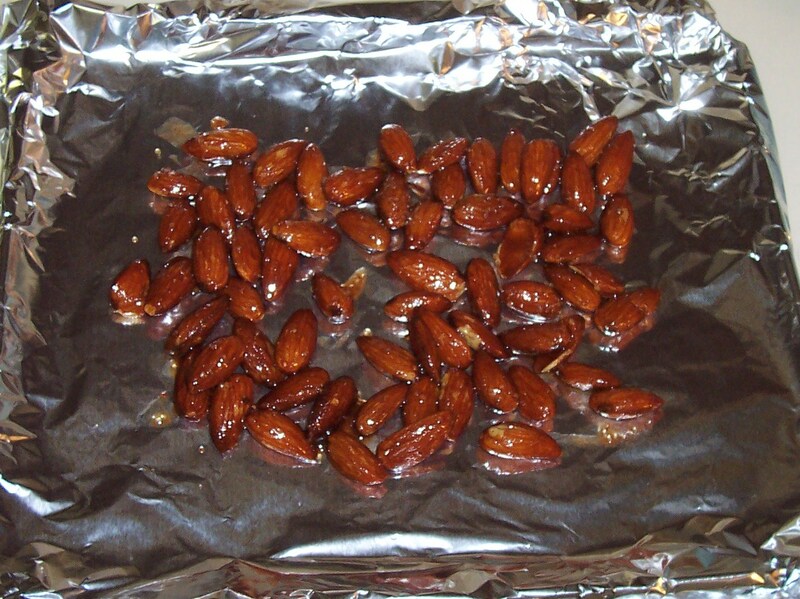 I stirred all until the Sugar was dissolved, then baked the Almonds in a toaster oven for about 20 minutes. Well, they weren’t that good. They did bond together like I hoped, but the Almonds were cooked too much inside. Unfortunately they basically tasted burnt. They looked okay, but the process didn’t create what I hoped. So don’t do this. 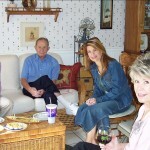 High Tea and Sophisticated Friendships in California. 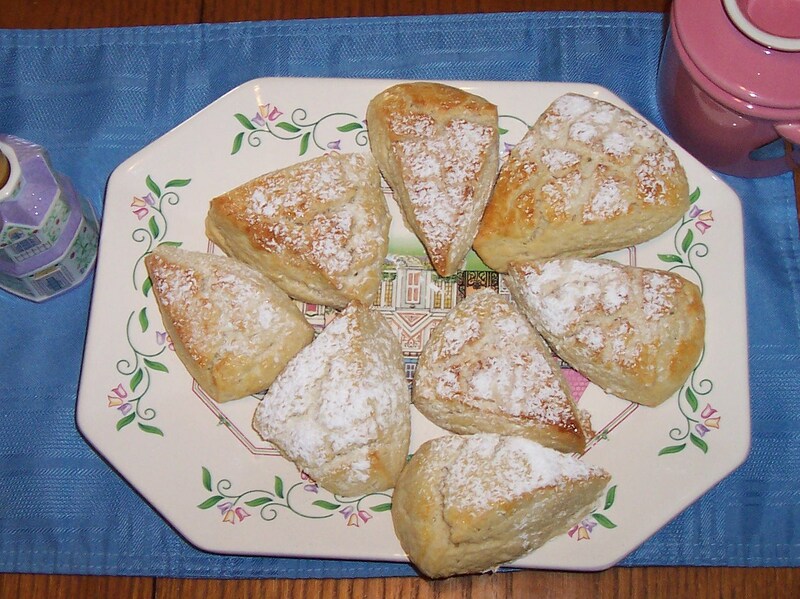 These Scones were PERFECT. I’ll never need another Scone recipe. I mean it! One of my very dear friends hosted this lovely High Tea to celebrate a couple birthdays. We had a wonderful time and meal. While getting ready to just show up, I thought to myself, she’s probably working hard right now. I appreciate her efforts even before tasting the fruits of her labor. In particular, the Scones were better than any I’ve had. We all said the same thing. She sent a copy of the recipe, so I attached it below. The Victorian House table setting was cute and cozy. She served Tea Sandwiches, aka Canapes, made of Chicken & Rosemary, and Cucumber & Cream Cheese — Along with all was Clotted Cream, Preserves, and Fresh Fruit. And mustn’t forget the Tea, an Orange flavored combination made by Monks. It was exceptionally aromatic. We all thought we were done when she comes out of the kitchen with Key Lime Squares. Come on now. She did the High Tea right. The food and the company couldn’t be beat. Thank YOU! http://www.theritzlondon.com/tea/ – You’ll see that The Ritz in London serves the same at their High Tea. I wonder if it’s as good? David and Sons. The Best Suns in the World. 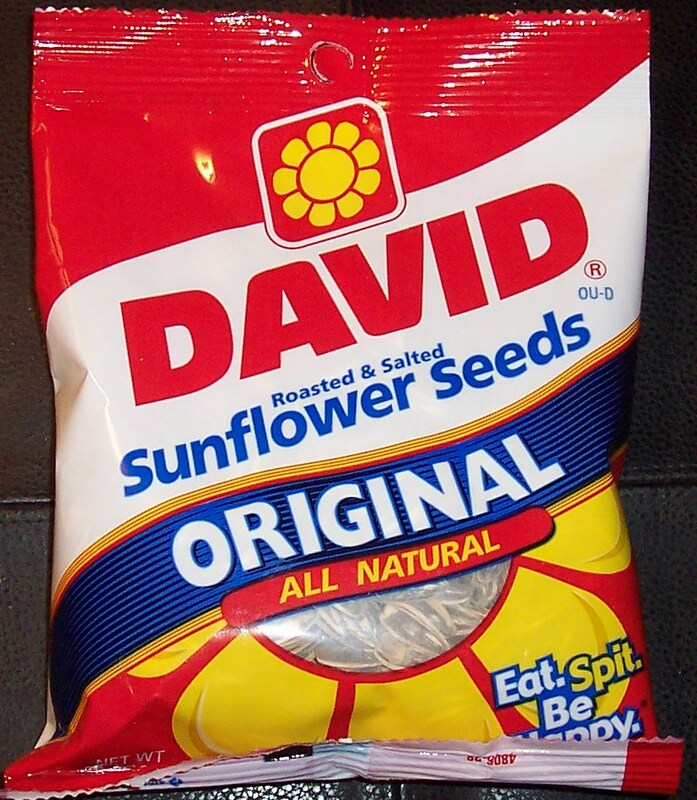 I’ve probably spent thousands of dollars on countless bags of these Sunflower Seeds over the years. Only David! No other Sunflower Seed will do. David is the best. POST UPDATE (11/10/08): Note to David – Why has your price sky-rocketed? The pictured bag used to sell for $0.89-$1.09, and now it sells for $1.39-$1.69. That’s too high! CVS is selling them for $1.69. That’s outrageous. What’s up David? Is it CVS or YOU? Dare I say one of the best meals I’ve ever had? I dare. And the service was friendly (not stuffy) and attentive. I fell in love with ALL aspects of the place. Each dish was a stunning treat, plus we got to tour the kitchen and the wine tasting area downstairs. It was more fun than Disneyland. Thank you for the amazing food and the opportunity to look around. 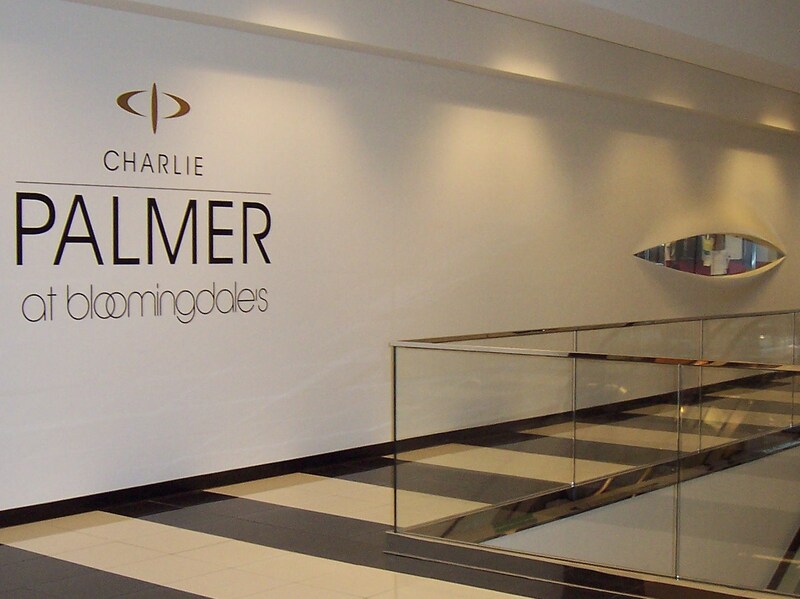 As of this date, Charlie Palmer at Bloomingdale’s has been open one week. My experience tells me that it deserves to have many years of success here. If locating the restaurant through Bloomingdale’s, you’ll be struck by the eye window looking into the kitchen. I was amazed. It’s one of the coolest things I’ve seen. The pictures below are taken of the restaurant entrance on the west side of Bloomingdale’s. The bar entrance is on the east side — Now it’s starting to sound like Manhattan Charlie. I really wanted to take pictures of our meal, but didn’t ask permission. I especially wish I had a photo of the Foie Gras, since it looked like a piece of art. It tasted incredible too. I was sliding down my comfortable chair it was so good. All dishes were truly superb. 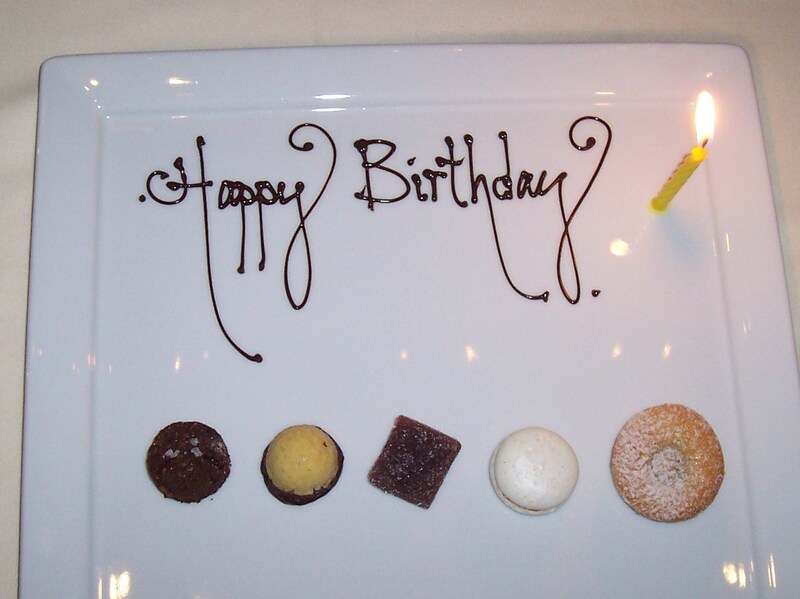 And since my friend blabbed about my birthday, they served a fun, unique Cookie and Jelly assortment. After that, I was glad that she did. I should also mention that the Root Vegetables were also complimentary, plus they served a Sea Urchin Mousse with Caviar and Crabmeat. We greatly appreciated the restaurant’s generosity and excellent hospitality. Everything was top notch. I couldn’t think of a better way to spend my birthday and I’d love to eat there again. Thanks for coming to California Charlie. PLUS: They sell good bottles of wine TO GO at comparable retail prices. And their Wine List is a computer, you’ll see. I had a fabulous Australian Syrah recommended by the nice Sommelier. Islands Birthday Burger and Kona Pie. Thank you for the birthday gift Islands — And what a great gift it was. I truly LOVE your burgers. 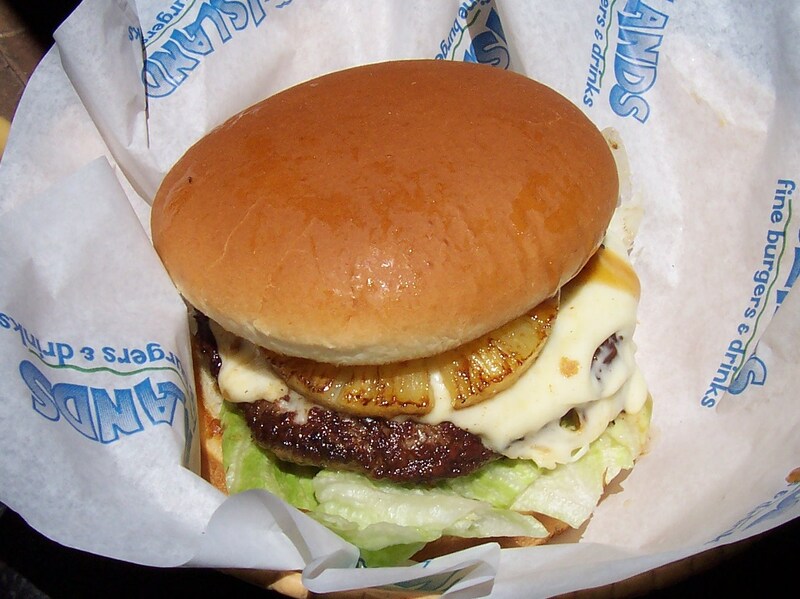 I most often get the Hawaiian Burger, which is what you see here. These pictures are taken on the patio at the Irvine, California location off Bison. The Kona Pie is very good too. I’ve enjoyed it a few times in the past, but this day I was on the run without refrigeration. The waiter brought it by for a quick photo, but then I gave it to a large party timed for dessert. That was fun to do — They were excited about it too. I REALLY wanted to take a bite, but you can’t give it away after that, and I knew I couldn’t finish it all — So I’m glad it went to a bigger cause. Thank you Islands. Your birthday gift was generous and pleasing. Lunch Blast From The Past. Lunch with Mom and Grandma at Black Angus Steakhouse. I had not been to one in years. And I’m happy to report that our meal was thoroughly enjoyable. The Salmon and both Steaks were nicely cooked. The Tarter Sauce should be mentioned as being very good — It has a strong dill flavor. 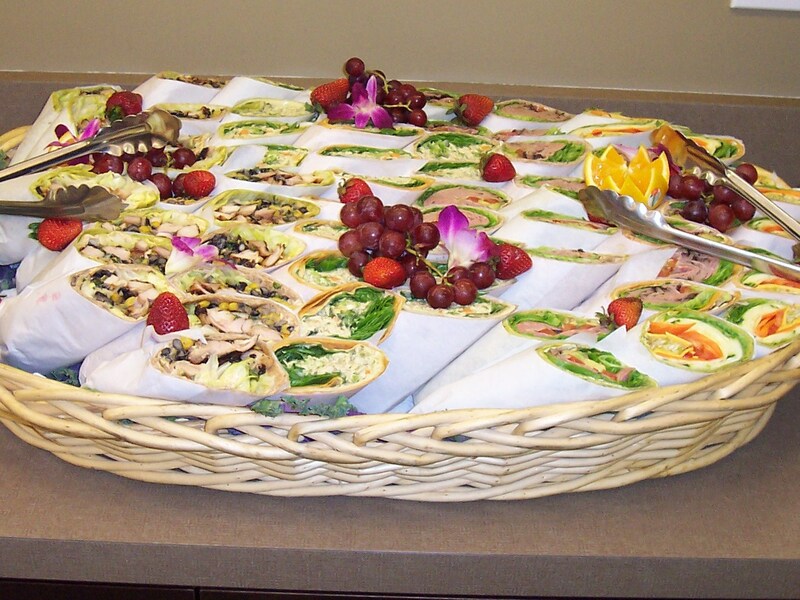 All was served at the Cerritos, California location. As a side note, I used to go dancing there when it was THE THING to do. It took me back. I’m not sure if people still dance there at night? Sea Scallops Over Bay Scallops. 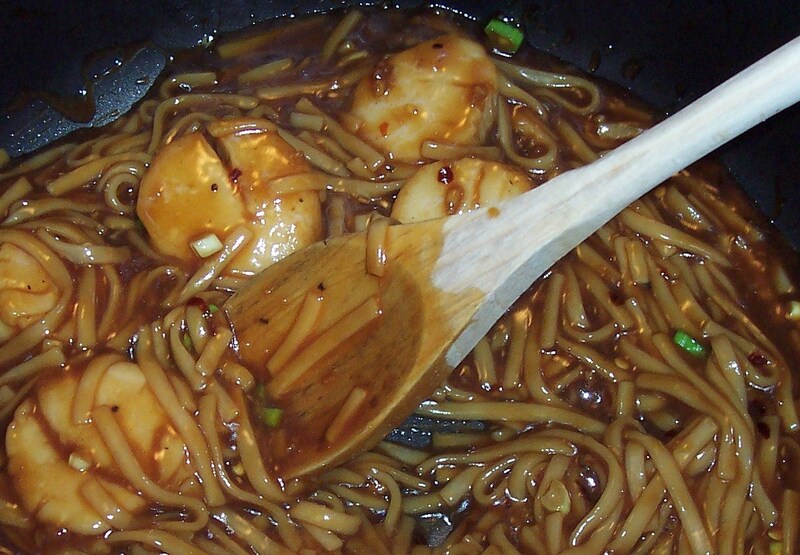 First sear the Scallops, then add them to a Sauce made of Rice Wine Vinegar, Soy Sauce, Sesame Oil, Sugar, Red Pepper Flakes, Garlic, Scallions, and Cornstarch — Stir in cooked Udon (or other) Noodles. It’s super easy, fast and flavorful — Tastes like you’re at a good Chinese Food Restaurant. Only Sea Scallops for me every time — No Bay Scallops, thank you. Is There a Birthday in The House? Dinner at Charlie Palmer at Bloomingdale’s, which opened four days ago. WOW. WOW. WOW. 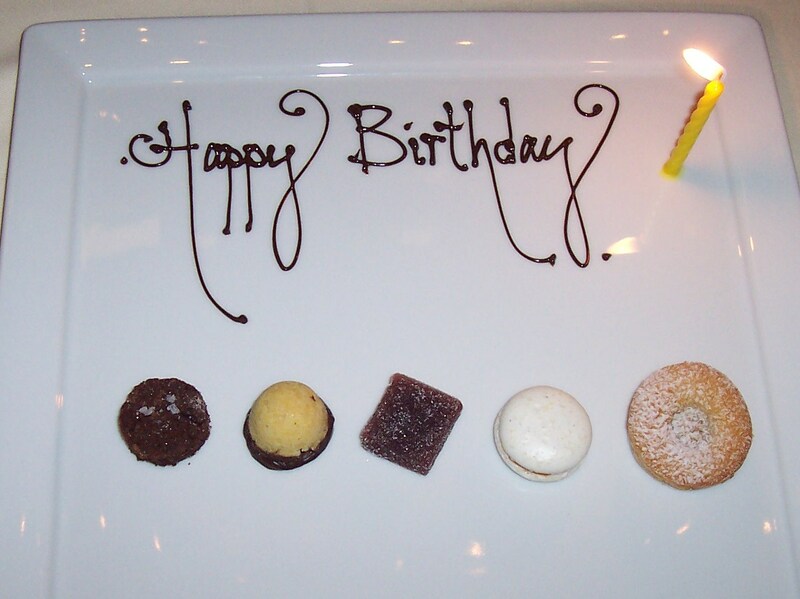 Lot’s to say about this fabulous restaurant, but now we’re focusing on the birthday dessert. Thank you for the stellar service and truly amazing food. And lunch at Black Angus Steakhouse with Mom and Grandma. The food was good there too, but cannot be compared to Charlie Palmer’s. I did appreciated both! Great Meatballs in Newport Beach. Great Meatballs are at the Spaghetti Bender on PCH. I like to swing by to pick some up, even if it’s out of the way. The Meat Sauce they are served in tastes homemade with hours of love. The Meatballs are airy and filling, not dense, nor hard like too many others. Two large Meatballs come in a side order. That’s what I got, plus an order of Garlic Bread. 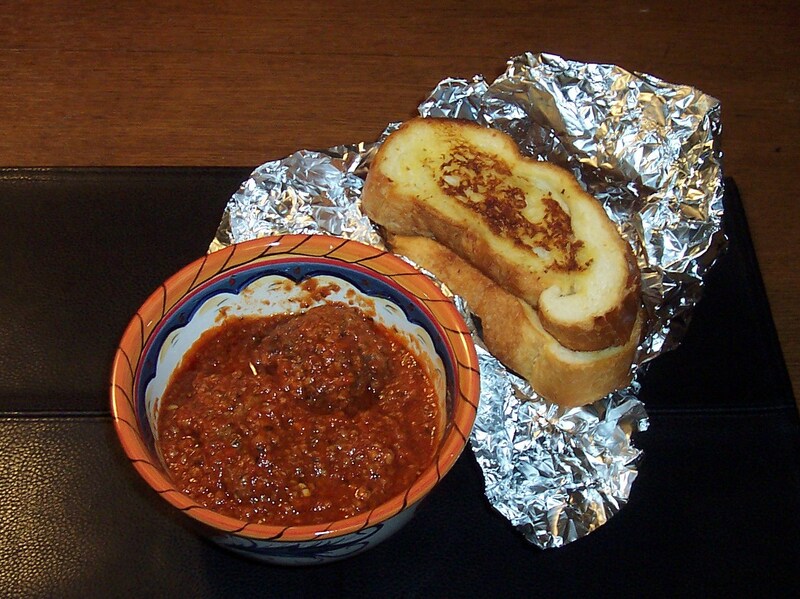 The Meatballs and Sauce are consistently good. In comparison, the Garlic Bread is just okay. It’s a little dry and doesn’t really have much of a Garlic flavor, but it’s nice to dip in the Sauce. Another item worth mentioning here is the Original House Salad, which is different and delicious. It has capers, avocado, tomatoes, and a few other ingredients I’ll need to report about next time I get it. As a bonus, there’s a large Rosemary bush out front. I usually pick a piece on the way out. It comes in handy sometimes and smells good. Now what should I use it for this time?